Welcome back for another couple of Farmer's Wife blocks in the quilt along. 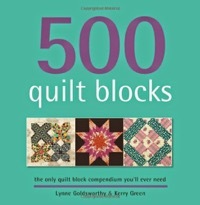 This week Jessie returns as guest blogger for the first of these blocks, number 47, Joy (p.209, letter p.94). Read about her block here. I didi find a slight discrepancy in the pattern (printed from the CD). The top edge seam allowance of section E (where it will join to D) came up well under ¼". All other seam allowances were fine so I'm not quite sure what happened but I'm mentioning it in case you find the same! Let me know if you do. I pre-cut all the block pieces using my usual generous rotary cutting measurements for foundation paper piecing. I used a mix of freezer paper templates and rotary cutting. 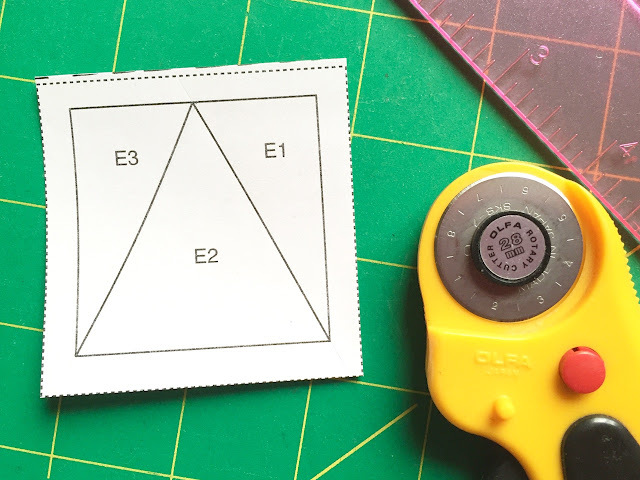 Remember to add ½" seam allowances to the freezer paper templates so that your fabric pieces are larger than needed. 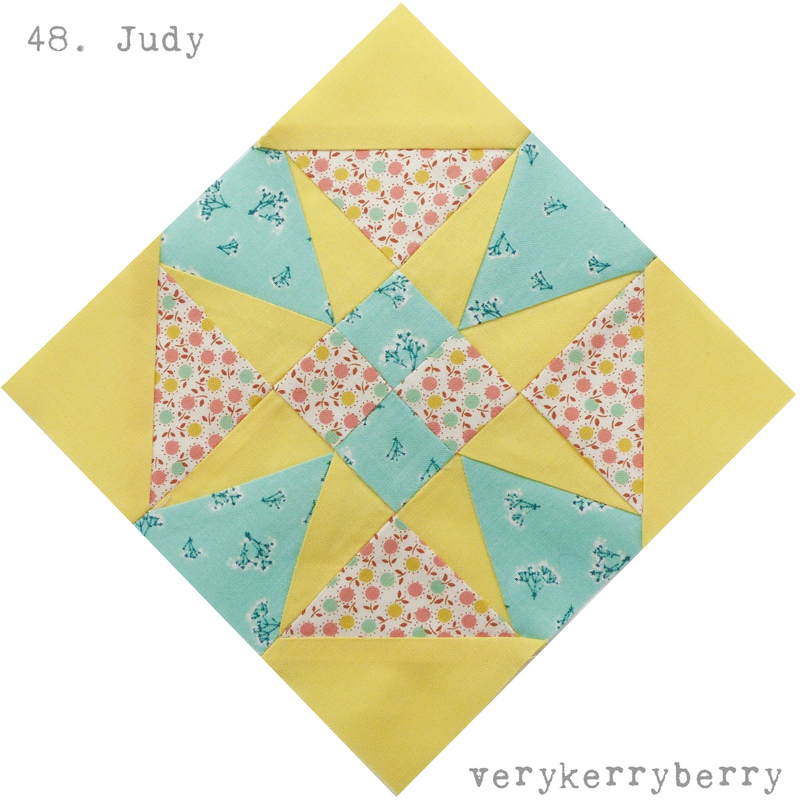 A4, A6, B4, B6: cut (2) 3 ¼" squares, sub-cut each in half diagonally to make 4 half-square triangles. For all other pieces, use freezer paper templates technique. Remove paper when needed- I leave it on as long as possible as it stabilises the sections. This can mean just tearing part of a section off. I remove paper when I sew section seams. I found the letter for this block a slightly odd read. It's from a farmer's wife who after many years of scrimping saving and not been able to go on a holiday, culls all her chickens and sets off for a break in a hotel. She ends up working there to fund the rest of her holiday and only returns when her daughters' write saying they have no suitable clothes left to go to school in! Hashtag #fw1930sqal on Instagram, you are welcome to tag me and you can also add photos to the Flickr group if you like to share there. 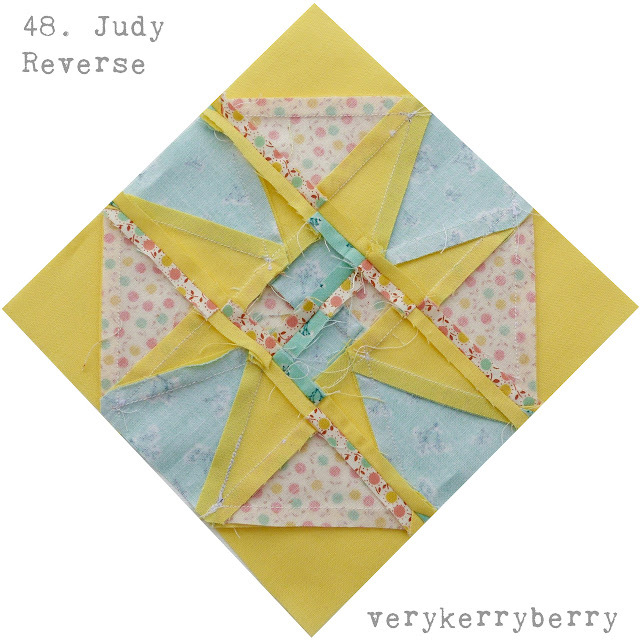 For individual blocks, you can use #joyblock and #judyblock on Instagram, Fat Quarter Shop and Angie are using these hash tags, #fw47joy, #fw48judy, I'm using both hashtag systems. Next week, Sarah of Pretty Little Fabrics will be back with me as guest blogger. Really love and inspired the block Joy. I really struggled with this block prints. I had green and red pulled out as book, but had went for blue and yellow instead! Need to acquire some nice purple shades and perhaps need to use some solid for the rest of the blocks. :) Thank you, Kerry! The Purple Flower fabric on #47 really hits home! I have several quilts from my grandmother, and this fabric seems so "familiar"! 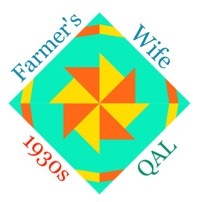 (I always placed the 2 quilts as from the 1930's or 1940's.) I have to say that #47 is my favorite block so far! 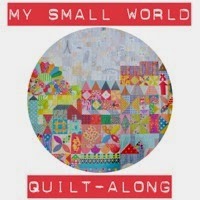 You must have a quilt on which the original of this reproduction has been made!